Theories developed for excavation analysis in the past have many limitations which is treated by limiting excavation depths, adopting conservative design, with these precautions some construction failures were observed. Now with increase in demand, deeper excavation depths are required; again construction sites are located in densely populated urban areas and observed more problems to adjacent properties. Through modern theories consider many variables related to excavation operations, but not enough to cope with change in site conditions during excavation operation. For this reason a monitoring system is important to monitor site condition during excavation and a well-arranged system can ensure safety and necessary corrections of excavation operation. Settlement nails are very common to monitor ground settlement, settlement nails are steel nails driven into ground to take foresight of a fixed point followed by back-sight of the installed nails measuring from reference level to determine ground settlement of that point. The fixed point mentioned is datum located at safe distance from influence of excavation. A reference point of building supported on deep foundation (like pile foundation) can be taken as fixed point. If there have not deep-seated building near excavation site a marking object outside the range of settlement can be chosen; if required permanent benchmark is set to treat as fixed point. Positioning of settlement nails: The settlement of ground to which we are concern may be of soil, concrete pavement or asphalt pavement; concrete pavement and asphalt pavement are of relatively high rigidity. Rigid pavement may not show any signs of underneath settlement, even though supporting soil gets settled. Thus a settlement nail penetrating only depth of pavement may not provide mark of settlement; in this case settlement nails should be driven to reach soil underneath as shown in figure below. Where buildings exist near excavation site, settlement nails have to be set along direction normal to retaining wall and in central section of excavation zone to determined settlement profile that represent the actual situation. The behavior of soil near central area and retaining wall are similar to plain strain. So installing settlement nails in these regions will show large displacement (settlement for ground and lateral deformation for wall) than that of any other regions. When a settlement profile of central area at initial level of excavation is recorded, it will be more convenient to determine the settlement of ground at the final excavation level and also in other sections. When settlement of buildings is concern, the measurement methods is the same as discussed above, except the settlement nails have to be on building elements like on wall or on columns etc. With the influence of ground settlement building may be tilted which requires separate devices. A tilted building may be damaged due to stress concentration and while excavation is conducting the tilting of buildings in vicinity to site should be monitored. To measure tilt of building we can measure settlements of 2 reference points. The difference of which will provide us an estimation of tilting. As a measuring device for plane surveying we can use theodolite or level; the difference found is divided by distance (horizontal) between two points. We can measure whether angular distortion or tilt angle. Angular distortion; when reference points are located on two adjacent foundation footings or adjacent column, the value measured is called angular distortion. Tilt angle; when tilt of any building is measured by tiltmeter, the measuring unit is the tilt angle. 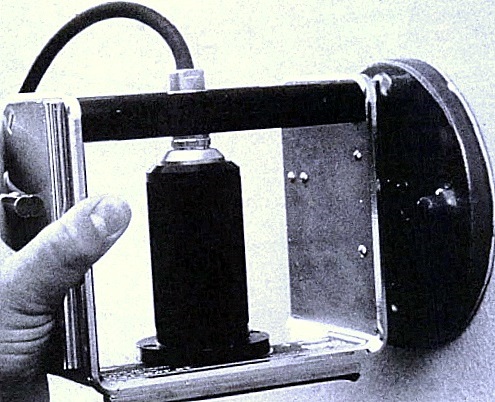 Tiltmeter is an identical device as that of inclinometer in respect of measuring principle. Like inclinometer, tiltmeter is also devised with a sensor can be of Vibrating type, Resistance type, Force balance type Tiltmeters, are commonly used with datum plate and indicator to measure tilt of buildings. Datum plate should not be influenced under temperature change and the material chosen for this purpose is ceramics (most common). This plate is usually installed to side of object that is to be measure. The tiltmeter actually determine degree of tilt of datum plate; this will yield tilt of structure to which it is fixed with. Two types of datum plate can be installed depending on the type of tilt meter. Datum plate may vertical and horizontal type. Figure 3 shows a datum plate of a horizontal type. 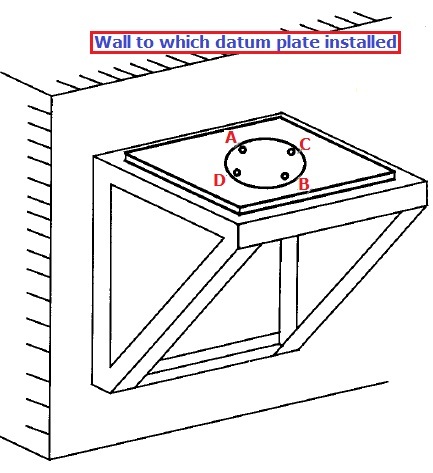 Figure 4 shows a photo of vertical type datum plate. As shown in Figure 3 there has four objects protruded from the plate to form two perpendicular axes (to each other). As usual one axis is parallel to the wall and other is perpendicular to wall AB & CD as shown in the figure 3 respectively. At first the tilt angle found in the AB direction is recorded. Then rotate the sensor by 1800 and measure another tilt angle. The average of two records is taken as tilt angle as it will eliminate system error in instrument. Same procedure is applied to measure tilt angle parallel to wall (along CD axis). Thus the two average values offer tilt angle along both directions. Tilt of building means angular distortion and rigid body rotation. If a building is only subjected to rigid body rotation, the elements of the building will not suffer any distortion neither gets deformed. Thus columns, beams, walls including foundation of the building will not be cracked, although if may result some esthetic anxiety and will some functional problems. The record we taken from tilt meter is a measure of tilt of a structure at the carefully selected point to which datum plate is fixed. To have a representative value that reflect the safety of any structure, the most preferable place to fix datum plate have to be determined based on structural behavior of that building and also keep in mind that convenient of recording. The walls and roofs are the most preferable location to install datum plate. In general, building exist within the influence zone of excavation should have tiltmeters. With the help of datum plate, record an initial measurement to collect initial vale which will be then deducted from the different values taken at different stages of excavation; obviously the difference will furnish us tilt angle of building under respective stage of excavation. Influence zone of excavation settlement proposed by Peck (in 1969) would be 2~3 times of excavation depth.Some researchers have proposed influence zone based on soil type. Like O’Rourke and Clough (in 1990) proposed to take influence zone for settlement about two times of excavation depth in case of sandy soils. When soil encountered is stiff~ very stiff clay, the influence zone should be 3 times of excavation depth. For soft ~ medium soft clay this value should be two times of excavation depth. There have many other suggestions about zone of influence of excavation, the details discussion is out of scope of this article.